Talk about a study in contrasts. In the dying hours of OpenWorld, Larry Ellison and Oracle unveiled their own social network. Even the name was awkward. The Oracle Social Network, Ellison called it, and as he demoed the thing on Wednesday afternoon during his closing keynote speech at Oracle’s flagship conference, he struggled to describe the basic ins and outs of a system that mimics what’s become commonplace with Facebook and Twitter and even corporate social services like Chatter from Salesforce.com. It was a moment that nicely summed up Oracle’s belated efforts to reinvent itself in the face of “disruptive technologies” challenging its traditional business from all sides. Ellison and company realize they need to move with the times, but these efforts feel much like an afterthought – and even half-hearted – and you have to question whether they can pull these new technologies off without undermining their existing business. At OpenWorld, the company rolled out not only a social network, but a “NoSQL” database along the lines of MongoDB and Cassandra and a “public cloud” that follows in the footsteps of Amazon Web Services and Google App Engine. In each case, Oracle is imitating technologies that have reinvented the enterprise IT world in recent years, and Ellison almost acknowledges that the company is late to the party. Last year, Ellison mocked the concept of the cloud, but he hedged this ongoing ridicule by saying that cloud services would eventually run on Oracle software and that many, including services from Amazon and Rackspace, already ran it – in a way. Now the company has inched closer to the cloud world is was skeptical of. There were also times when Ellison seemed to deny the imitations. “We didn’t notice last week,” he said. “We noticed a while ago.” But with these new offerings, Oracle is indeed trailing the pack. “I think they’re a bit late to the game,” Doug Toombs, a manager at research outfit Tier 1 Research, told Wired. In many ways, the company is simply repurposing what it already has. Oracle didn’t build a NoSQL database from scratch. It rejigged the existing BerkeleyDB relational database, trying to transform the old way of doing things into the new. OpenWorld itself reflected this effort. This miniature city of a conference began like it always does. 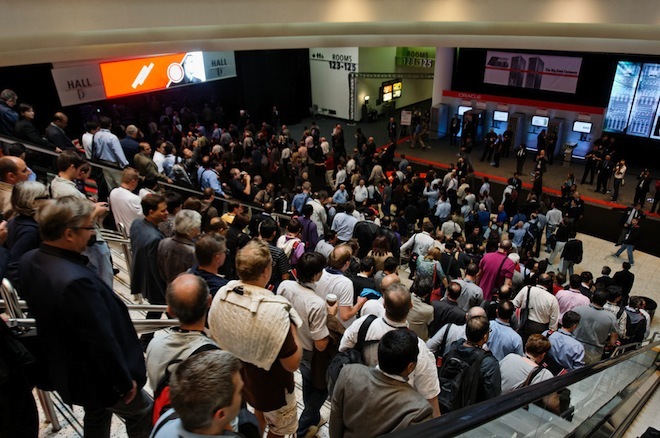 All three convention centers of the sprawling Moscone complex were packed to the gills with customers, analysts, entrepreneurs, press, vendors, and developers. Massive red and white tents filled a barricaded city block. An America’s Cup racing simulator dominated one of the halls. And Ellison kicked things off by pitching some very old-school technology, hailing the company’s hardware appliances as the future of the enterprise. But then, bit by bit, the new messages spilled out onto the more than 45,000 people in attendance. He was still Larry Ellison. And this was still Oracle. But the new terminology crept in, and the two didn’t exactly seem to mesh. There was the Oracle Social Network, and yes, they will call the other two the Oracle Public Cloud and the Oracle NoSQL Database. Like Dell and HP, Oracle wants it both ways. It wants both the old and the new. While this is certainly a more sensible strategy than placing all your bets on the old, the balancing act isn’t easy to pull off. Clearly, Larry Ellison isn’t completely comfortable in those shoes either.